Merry (belated) Christmas & happy holidays! How was your holiday? Ours was low key, relaxed and over all just really lovely. I stuffed myself with roasted potatoes and Yorkshire pudding and washed it all down with a couple glasses of champagne. So you could say that I was comfortably in the ‘merry’ stage. It was great. And now we’re here! I gotta say – after these past few months of eating, baking and indulging I’m pretty excited to just take a minute, step away from the cookie dough, and focus on eating a little cleaner for a bit. Not to be the biggest cliche in the world, but I love that January is usually dedicated to clean eating and healthy habits for a lot of people. 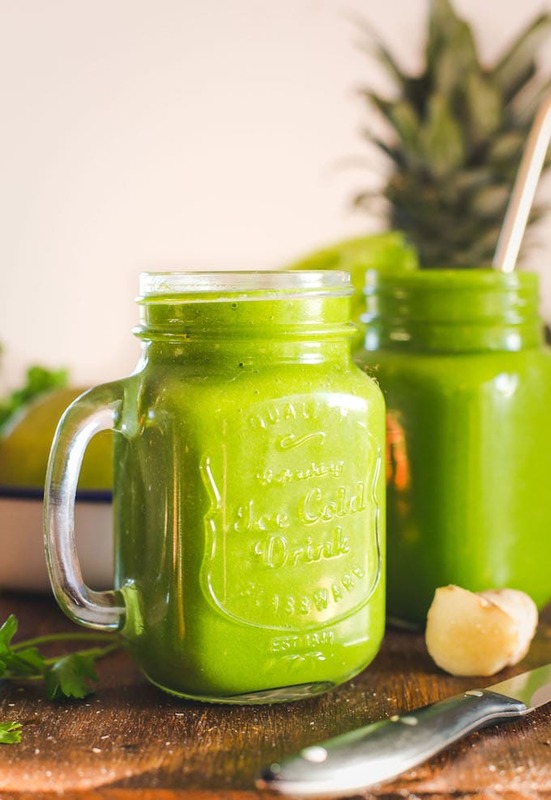 It’s refreshing in multiple ways….just like this green monster smoothie! It’s fresh, zippy, and 100% good for you – and best of all – it’s just a smoothie so it’s super easy to make. Like most smoothies you can play around with the flavours if you like by adding more or less pineapple and mango to adjust the sweetness, etc. This smoothie is a really great way to get a healthy start to your morning. I personally enjoy blending it together later in the day as more of a pick-me-up and it really does the trick. However/whenever you have – I hope you enjoy! 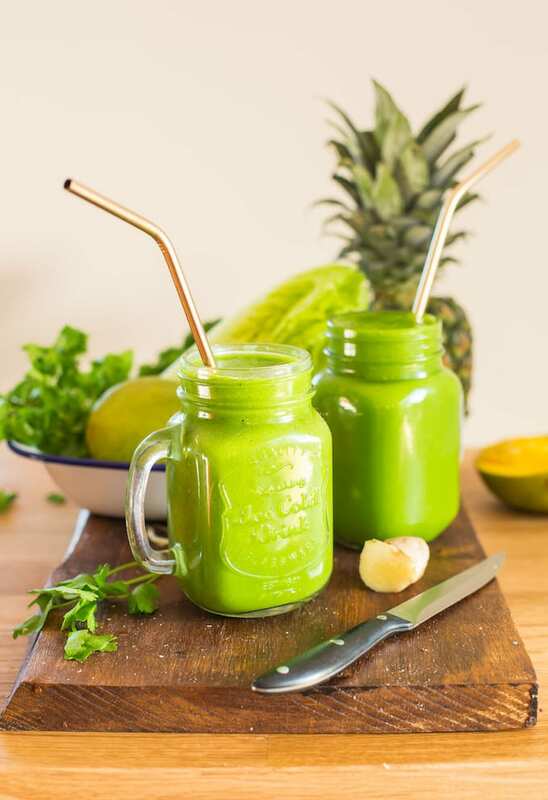 Don’t forget to #asaucykitchen on instagram if you try this Green Monster Smoothie! I’d love to see what you make with it! You can also post your pictures to my facebook page! Add everything to a blender and process until smooth. Add more water as needed. 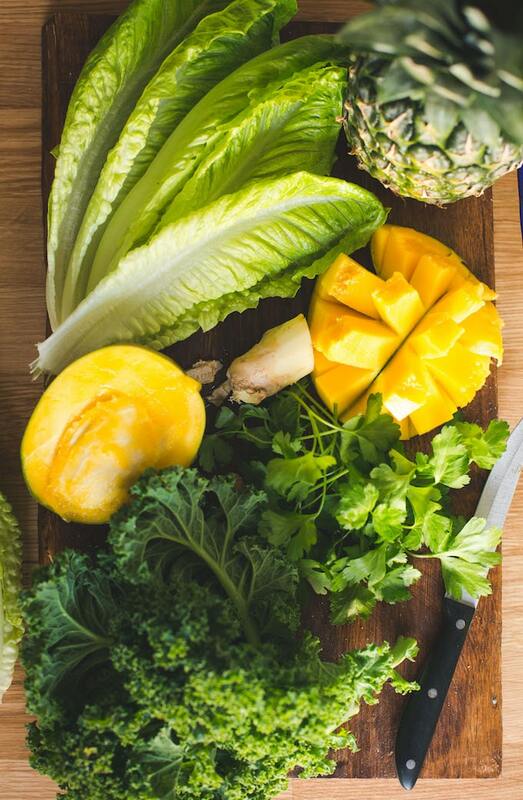 If using all fresh ingredients you may want to blend additional ice along with your smoothie or just add ice to your smoothie glass when you drink it. Ginger can be a very powerful ingredient - especially if you're not used to it. If you're not sure you like it I recommend using 1/2 inch at first. You can always add more if you like it.